David Foster Wallace was a novelist, short story author and essayist. He is best known for his second novel, Infinite Jest, which is considered as one of the best English novels by Time magazine. He is known as one of the most influential writers of contemporary America. 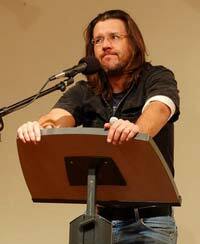 David Foster Wallace was born on Feb 21, 1962, in Ithaca, NY. He spent his early childhood years in a small town named Philo in central Illinois. Both of his parents were professors. His father, James Wallace, was a professor of philosophy at the University of Illinois, and his mother, Sally Wallace, was an English professor at Parkland College. Just like any other kid, David was interested in sports, TV, and games. In fact, he was selected as a junior player in the regional tennis team. He graduated from Amherst College after majoring in English and philosophy. He also pursued an MFA in creative writing. Wallace was fascinated by Mary Karr, the author of the Liar’s Club and other masterpieces. In spite of knowing that Mary is happily married, Wallace pursued her romantically and intellectually. After many failed relationships with women, he met Karen Green, an artist whom he later married. At the age of 46, David committed suicide in September 2008. It was reported that he was suffering from depression and was on anti-depressants for several years. David’s first novel was The Broom of the System, the book which gained national fame and acclaim for him. While working as an English professor at Illinois State University, David started working on his epic masterpiece, Infinite Jest, which was published in 1996. Infinite Jest is a multilayered novel in which the emotions of the characters are described in extensive detail. He was awarded a MacArthur Genius Grant in 1997. During the same year, he was also awarded the Aga Khan Prize for Fiction by The Paris Review for one of his works published in the magazine. He also received the Whiting Award, the Lannan Award for fiction, the O. Henry Award and others. David Wallace continued teaching and publishing short stories and essays in various magazines, including The New Yorker, Harper’s, The Paris Review and Esquire. Some of his famous work includes Brief Interviews With Hideous Men, Consider the Lobster, A Supposedly Fun Thing I’ll Never Do Again and several others. In 2004, he published his last collection of short stories, entitled Oblivion. During his last year, David was working on The Pale King. The unfinished work was completed by Little Brown and Company, and the novel was released in April of 2011. The book was a huge success and received several positive reviews. Wallace invented a new writing style that blended comedy with sharp, loaded vocabulary from different types of fields. In his books, he used several long explanatory footnotes and endnotes. He was known for his difficult word choices and lengthy demanding sentence structure. He captivated readers with his prose and mesmerized them with his brilliant thoughts.